Ben Lesnick and Dan Tracy give a look at the Hull’s development. Adapted from Aieris’ transcript here. Ben – Thank you Sandy and Me, I’m here with Lead Technical Designer Dan Tracy, and we’re talking – what else – the Hull series. Hey Dan. Dan – How’s it going? Ben – Not bad, seen a lot of each other in the past few days, as we fought with cargo numbers and ship sizes. Dan – It’s a lot of back and forth right? Development and work in progress. Ben – I think people would be surprised to see how much work goes into getting the ship out on the website. Dan – Tell me about it. So what did you want to talk about? Ben – I guess we’re going to talk about the development of the Hull series. I will kick it off, because I was the person who initially invented them as backstory for a Jump Point. They were originally just a riff on Larry Niven’s General Products hulls, when they were 4 or 5 different sizes of those in his worlds, and I thought ‘we should totally do that,’ and so there were originally four or five, it was A through D, it was in the MISC article in jump point. Then we pitched it to the community, you guys voted for it, and then you came in and made it cool! Dan – Well, it was a group of us really, when we were talking about how can we set up an interesting design for a ship that can actually haul cargo, more zero-g-oriented environments. 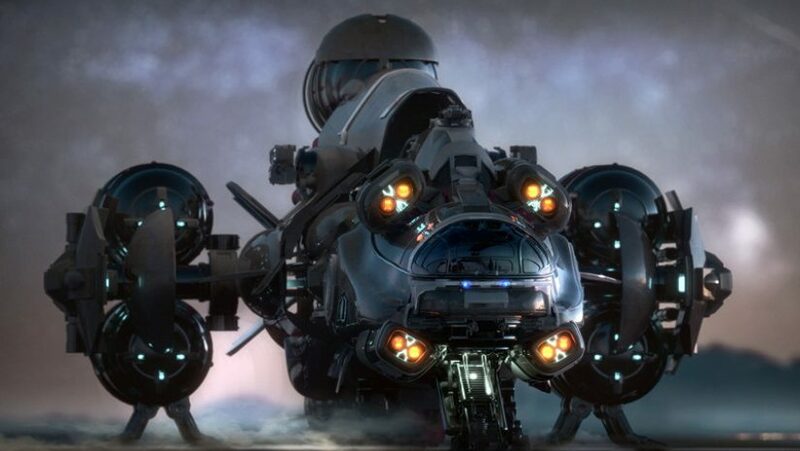 We came up with this interesting concept, it’s been around with other sci-fi shows as well, but more the external cargo placement of these things, and of course that has its own inherent side effects of exposing your cargo so it could be shot, but if you’re in, say, UEE space, or if you have a lot of people escorting you, you shouldn’t worry about it. Ben – I hear about that all the time, and I think you’re not a very good pirate if you’re trying to gun down the cargo. Dan – Exactly, but that’s the benefit and the drawback of the Hull series: With each one of them having all of its cargo on the exterior, that means you can have tremendously more cargo than a lot of the other ships. And I see a growing concern that people think we have maybe the wrong metrics, and I would have to say, for some of them we did, because we had some of the measurements, some of the ships were originally weighted for ‘freight units’ at the time, which, in terms of the XYZ dimension, was 0.25 by 0.25 by 0.25 [metres]. Which actually equated out to something like 1.1, I can’t remember the numbers. Whatever. Those were actually in a very small cubic dimension. For each one of the particular interior nodes that we’re developing, and you can see them in the Grabby Hands video that came with the design post, which actually has all these internal item placement nodes. You can think of it similar to other game titles that have a 2D grid that have cells in which things are being placed. Ours is actually going in 3D. So, each of those particular node bases are 0.25 meters, so you could put a gun, or a lamp, or whatever inside a box, and it fills its particular dimension inside of that crate. Now, for a lot of the ships, 0.25 doesn’t make sense, cause they’re anywhere from between 10 meters to 20 meters to 100 meters in terms of their particular length or width or depth, so to make it easier for us we were just measuring out a lot of them with the simple box dimensions in 1 meter grids. But also for our metrics, for what we want to have as cover height is 1.25 m. So there are a lot of numbers that kind of get lost in translation, especially when we’re trying to give it all to either Turbulent or to community or internal design and animation departments, all the numbers might get lost, so we’re trying to rectify that right now by actually measuring the specific internal game dimensions of these things. So as long as it’s physically accurate, we’ll give you guys the actual dimensions that you need, and the thing we want to hit most of all is making sure that the Hull series is as capable as like the Freelancer MAX, or the Banu Merchantman, or the Caterpillar. Every one of those ships has their kind of equivalent, but for the non-Hull series, those are contained in the internals of it, except for maybe the Starfarer. Dan – But with those, we wanted to make sure the Hulls were comparable, and then the Hull E being gargantuan. Being able to ‘hull’ the most cargo you can actually move around with. Sorry, I went on a tangent there. Ben – No, that’s the stuff people find interesting. Dan – As you can tell I wanted to get that off my chest, i’ve been seeing that from multiple angles. Ben – It’s all his fault! No, by the time you folks see this, the corrected, Dan here’s gone through and measured every ship we have in the game, and made some estimates for things like the MerchantMan that are not in the game, so we’ll have corrected numbers on the website. we’ll show you the numbers both in terms of meters and SCU, so you’ll have the data. Ben – The ships are immensely modular, that was kind of the idea going in. You can put whatever sort of box fits in them. Tell us about what the vision for boxes is. Dan – To take a step back a little bit. The modularity for the Hull probably makes it the most unique feature of the entire series. With the Hull A having its arms actually outstretched more from the side. It’s the only ship that can land with cargo on planets, but the rest of them, since they’re set up with booms in a cross like pattern, it allows cargo be attached off to the side here, up and down, and depending on the C, D, or E, you can have ones that stretch all the way back across booms. We call those spokes or wheels. The idea with the boxes is that we had the idea of some of our particular components or equipment in a scaffold. So that way we can have box like shapes exposing the components. We thought, since the E is able to pull around immense objects on massive booms, then we can possibly put small fighters there, if we maximize the entirety of it. So when I put that into the engine, I actually put a bunch of hornets side by side. I noticed on the E I could actually fit 2 and a half hornets across entirety of the arm. We thought, wow, ok. You could transport ships on these things. It makes sense because if you have a big rig, you can have a lot of these cars situated on the back of big rig trucks that are transporting them from manufacturer to dealerships. So in that way, that makes sense even for the Hull series to carry around numerous fighters. But they might be dismantled without munitions. In essence, you could essentially have people that are preset inside, a pirate clan with the ships in boxes. We’re going to make it so it’s all physically based. You have to pull everything down, open everything. This is going to take minutes, so it’s not going to be a fast excursion, like I’ve seen on the forums, like with people asking these to be pseudo carriers. With the unboxing in mind, it’s very similar to the grabby hands, very deliberate. You have to unfold from the top, undo all the straps that are keeping you locked into place, pull down the scaffolding to deploy your ships, then leave to make sure you’re not crashing into the other Hornets that are scrambling with you. It’s not going to be a 0-10 second take off like you could probably do in an Idris. It’s going to be something that takes a long time to do. So, sure! If you have 10 minutes to deploy, go raid a system with a Hull E! Dan – If it takes 100 people to launch an assault, I think they deserve it. Ben – Not to mention how difficult recovery would be afterwards. Dan – You can’t really, because you’re basically exposing everything and being dropped off into space, floating away. You probably can’t recover that. It’s basically a one-time deal. Dan – That’s exactly it. Ben – Tell me about scaling the Hulls, because I know we were involved in this in the last couple days before the sale. Dan – So the size of all the different Hulls was an interesting approach because we had all sorts of different concept designs from Jim Martin and we were looking at making sure they had a very similar approach so we could reduce some of the production time and cost to make it, but, we wanted to make sure they’re unique and scalable. So that’s where the whole modular approach came from, in order to make this thing really easy to build later on. So, with scaling, we figured we’d want specific classifications, so we had the Hull A to be the equivalent or better than the Aurora, the B being similar to Freelancer/Constellation, the C being bigger than that going up to Retaliator size, the D even bigger, and E wasn’t even a concept until we talked about it more and more and said why don’t we have something a quarter the size of a Bengal. That way we can have something that’s of monstrous size. This helped out John Pritchett and Pete Mackey look at establishing what the thruster sizes are going to be all the way up to capital ships. We’ve barely touched the thruster size for the Bengal, so this is a good stepping stone. We wanted to cover a whole range of ships all the way from Aurora to the E, which is a similar size to the Idris. So if you had something that could haul as much cargo as several different Starfarers at the same time, then it’s even bigger and something more preferable to a big corporation. We wanted them to be going exponentially bigger. Yes, they’re not exactly linear or directly exponential. There are some bigger gaps between the C and the D, and even the B and the C. That’s really reflected by the cost analysis that we did. The B being a lot lower cost than the C and then that scales up accordingly. But we wanted to make sure we hit the particular categories that these ships fit into rather than a linear scale of A through E.
Ben – I think it turned out really well. I just remember watching you resize them until we got it feeling exactly right. Dan – Exactly. The numbers in the end, the thruster ratings that we’re applying to them, we’re running into a struggle right now with the thruster calculations of these massive ships pushing something of 64 times their own weight in cargo. So we’re using a mean difference. There’s probably going to be a post later on about this, about what are the weights of these particular ships when weighed down with water. We’re using water as a baseline because it fits into the metric system perfectly. 1 kg of water is actually 1 meter cubed in terms of weight and volume, which is fantastic, we’re using that as a mean for that. We’re going to be throwing out weight distributions based on Iron ore, Tungsten, etc. Ben – Particular shout out to Pete Mackey. If you folks are ever wondering why sales can be so late in the evening, it’s because we’re doing things like reevaluating all the thruster sizes, a suit with a ship holding a mass of water. I think we were on a call late at 9 at night with you and Pete and Travis, and he was in Austin reading, trying to calculate all this. Dan – There’s a further complication to weight with the mass. Each one of these crates, in terms of their SCU, that is their external SCU. So if you look at a suitcase, you look at the interior volume, not the external volume. But we looked at the exterior volume since you stack all these things on top of one another. What we were looking at in terms of exterior volume was, we were using a standard size crate of 3.75 x 2.5 x 2.5, and then that shrinks down by a matter of 0.125 meters on all dimensions, so that way you have an actual depth to the box to provide some structural support, then that is the internals of what you can put inside of the box. It was demonstrated a little bit with the grabby hands. I wanted to make sure that people understand those volumes inside your cargo holds, you’re putting crates inside of them, but then those crates have their own internal volumes. So you have an Inception of things inside of things inside of things. Then you have to accommodate for all of that, including the weight of the crates. So forgive us if our math is sometimes wrong, but there are a lot of things we have to make sure we’re accounting for. Ben – We’ll get it right eventually! So what are you working on now? Dan – Right now, still figuring out some of the final sizes for some of the cargo. Once we’re happy with this, we wanted to make sure we extrapolate from what we learn from Grabby Hands and look at a zero-g demonstration of moving cargo from a Hull E and then bringing it over to a space dock, Gold Horizon, or down to a planet. Ben – Very good! Thanks for coming on and talking Hulls! We’ll see you the next time we release an incredibly complicated design.